His mother and both his grandmothers are seamstresses, and Christopher Gill, this year’s winner of the coveted Gert-Johan Coetzee fashion design bursary, has been living and breathing fashion all his life. The 26-year-old shop assistant from Lephalale in Limpopo is looking forward to learning the professional techniques that will turn his needlework hobby into a fulltime design career, thanks to the R168 000 bursary, which was awarded this past weekend at the Northwest School of Design’s (NWSD) Platinum Fashion Festival. Much like Coetzee himself, Gill made clothes for his sister’s Barbies as a little boy; and he remembers his first proper dress very well. He was around 11, and the dress was a purple and silver outfit complete with beading, which Natasha, his sister, wore to a modeling show at school. As a teen he started making dresses for friends and over the years his hobby turned into a modest business with word-of-mouth references by friends. Yet due to financial constraints the dream of studying fashion design and the professional polish that it would bring was always out of reach. “I’m overwhelmed at the thought that it is really happening, and that I’ll be learning from a master like Gert-Johan,” says an excited Gill. It is exactly that burning passion that clinched the deal for Coetzee, who graduated from NWSD in 2005, also taking home the Designer of the Year Award. “Skill and technique can be taught, but what I look for when interviewing the candidates is that same passion that I’ve always had – the overwhelming desire to create beautiful clothes and the hunger to learn how to do this as a profession. Chris has already started on the road to a design career and I look forward to seeing him develop his full potential over the next three years.” The bursary pays tuition and study materials for the duration of the three-year degree, and includes two high-end professional Bernina sewing machines. 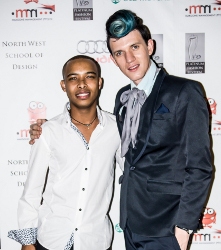 The Gert-Johan Coetzee fashion bursary is now in its fourth year, and the aim, says Coetzee, is to equip a new generation of designers with the skills and know-how to make it in the fashion industry. That is why a personal mentorship by Coetzee is an essential part of the prize, and sees the bursary students spending time interning at his busy studio in Linden, learning the practical applications of the trade. The personal attention certainly seems to be paying off, with bursary holder Prudence Kau, now in her second year, winning the Designer of the Year Award at the NWSD Platinum Fashion Festival last weekend. She follows in the footsteps of Coetzee himself as well as John Wayne Keyser, the first-ever beneficiary of the bursary who is graduating this year, and has his sights set on opening his own bridal studio one day. Gill will be joining Kau and last year’s bursary winner Quincy Thabang in Klerksdorp in January. The fashion world had better keep an eye on this very driven, talented group of youngsters!